Where is the Tidal Basin in Washington DC? The Tidal Basin is located north of the I-395 Bridge and southwest of the National Mall. It is a scenic Washington, DC attraction that is part of West Potomac Park and is maintained by the National Park Service. The Jefferson Memorial, the Franklin Delano Roosevelt Memorial and the Martin Luther King, Jr. Memorial are set on the edge of the Basin and make this a extraordinary place to walk and enjoy the scenic views. The famed cherry trees surround the Tidal Basin and bring thousands of visitors to the area each spring. For a guided experience with insight and history about the area, take a sightseeing tour. By Car - The Tidal Basin is located in the heart of Washington DC and is accessible from the south via I-395; from the north via I-495, New York Avenue, Rock Creek Parkway, George Washington Memorial Parkway, and Cabin John Parkway, from the west via I-66, Routes 50 and 29 and from the east via Route 50. (see a larger view of the area on the next page). During cherry blossom season, traffic is very congested and driving is not recommended. Parking is very limited in this part of Washington, DC. Depending on the time of day, day of the week, and events going on you may be better off taking public transportation. There are over 300 FREE parking Spaces at East Potomac Park on Ohio Drive (east and south of Buckeye Drive). See information about parking near the National Mall. Handicapped parking is designated along West Basin Drive at the Franklin Delano Roosevelt Memorial and southbound Ohio Drive on the Washington Boundary Channel side of Hains Point. By Metro - The best way to get to the Tidal Basin is by public transportation and on foot. It is about a 10 minute walk from the Smithsonian Metro Station. From the station, walk west on Independence Avenue, continue until you reach the grassy area of the Basin or to stay on a paved walkway, turn left on Raoul Wallenberg Place SW and follow it to the Basin. Additional Metro stations nearby include L'Enfant Plaza and Foggy Bottom. See a Guide to Using the Washington Metrorail. By Bus - The DC Circulator Bus offers easy access to the the Tidal Basin. During cherry blossom season, a special shuttle runs between Hains Point and the Jefferson Memorial for $1 per person, daily from 10 a.m. to 7 p.m.
By Bicycle - Capital Bikeshare offers short-term bike rentals at hundreds of stations throughout Washington DC. You can join for a day, three days, a month or a year. Take a bike from any station and return it to the station of your choice. During cherry blossom season, a special bike corral will be set up at Jefferson and 14th SW on select dates. By Water Taxi - During cherry blossom season, you can also take a water taxi to the Tidal Basin from Georgetown and enjoy viewing the blossoms from the water along the way. Tickets are must be purchased online in advance from www.DC-Watertaxi.com. 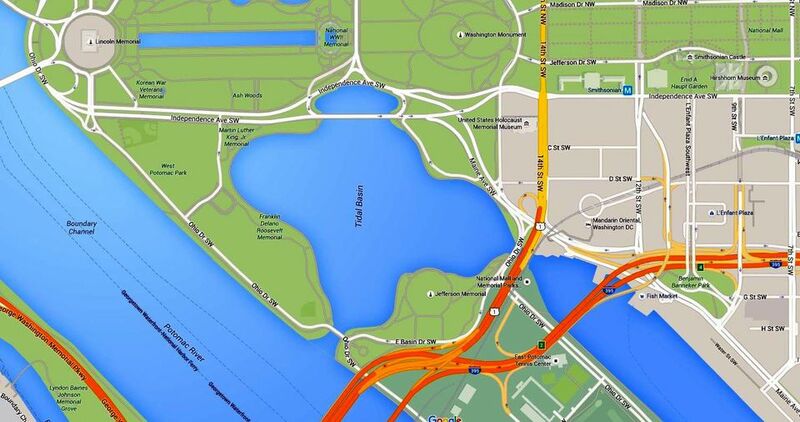 This map shows and overview of the Tidal Basin and the heart of Downtown Washington DC. The pink line indicates where the cherry trees are planted. By car, the Tidal Basin is accessible from the south via I-395; from the north via I-495, New York Avenue, Rock Creek Parkway, George Washington Memorial Parkway, and Cabin John Parkway, from the west via I-66, Routes 50 and 29 and from the east via Route 50. During cherry blossom season, traffic is very congested and driving is not recommended.